This is an advertisement promoting Henry Capel's Art Furniture. The original image has been transferred photographically onto a lithographic stone.Traditionally, lithographs were made by printing from a stone or other flat surface (now often a metal plate), on which the artist draws or paints the original design with a greasy substance. The surface is next prepared, moistened and inked; the greasy printing ink adheres to the design, which is then printed onto a sheet of paper. Henry Capel was one of several furniture manufacturers who specialised in 'art furniture'. This image shows some of the characteristic examples of this style of furnishing: lighter spindle-turned furniture, the use of painted panels and tiles particularly with figurative designs, and reformist Gothic designs. Capel worked particularly closely with the architect Alfred Waterhouse (1830-1905), producing furniture and fittings for over 30 of Waterhouse's buildings. Waterhouse probably drew the designs for these projects, which reflect his interest in Gothic and medieval architecture. Capel is recorded as working throughout the 1870s, and exhibited at the Paris Universal Exhibition of 1878. Capel's shop was in the vicinity of Tottenham Court Road , an area of London that, after 1860, specialised in ready-made furniture. 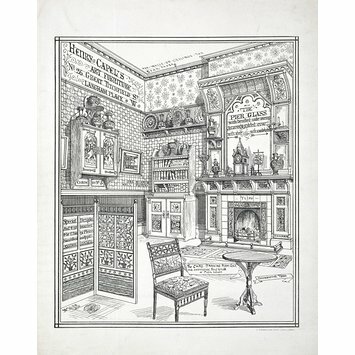 At the end of the 19th century many of these furniture manufacturers promoted their products with trade catalogues depicting interiors and listing the objects. This advertisement uses a similar format. Show-card, shows a corner of the showroom arranged as a room setting. The walls are divided into dado, filling and frieze. Furniture and fittings include a: wall cabinet, sideboard, fireplace, screen, drawing room chair and occasional table. Objects are annotated with names and numbers. Printed in black on white. 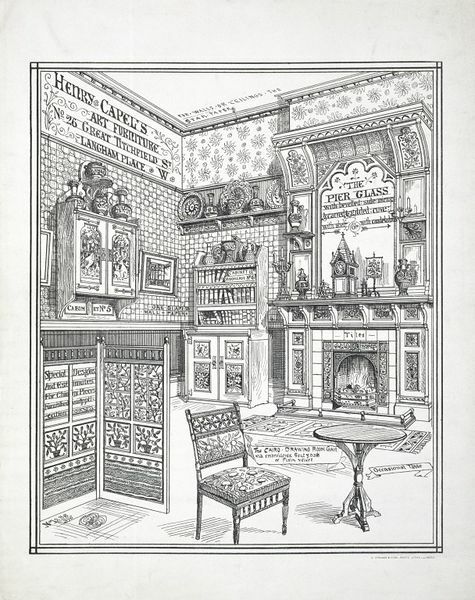 This advertisment for one of the leading furniture suppliers of the 1870s shows a corner of the showroom arranged as a room setting, the walls being fashionably divided into dado, filling and frieze. The furniture, much of which is loaded with 'art' pottery, betrays the wide range of influences, including Reformed Gothic, Japanese styles and Old English, which together lay behind 'aesthetic' or 'art' furniture. Capel exhibited a piano and stool at the Paris Exhibition of 1878 and between 1869 and 1882 he made furniture for leading architects such as Alfred Waterhouse and Norman Shaw. The chair in the foreground, is called 'Cairo' from the bobbins in the back, inspired by those on Egyptian screens.